It’s best to count as the free pattern prescribes, as it will save you lots of frustration and time; as I remember, the 6th row as integral to getting it right. 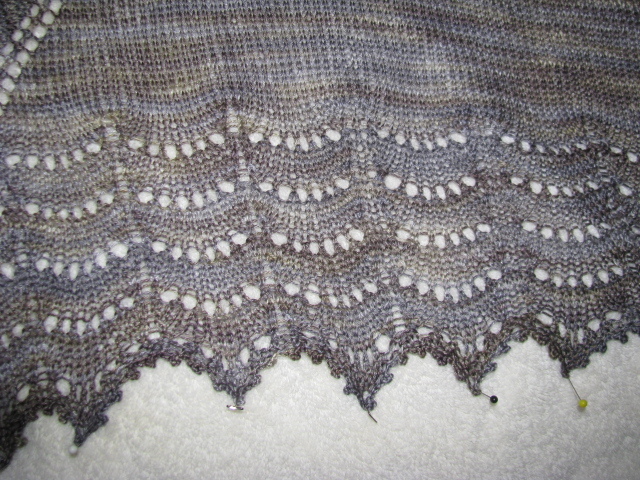 It only took about a week to knit and the stitch definition is most pleasing for a first lace shawl. These photos were taken outside today, Labor Day, bright and sunny, so the colorway is a little washed out, but you can see, it will do easily with brown or black. 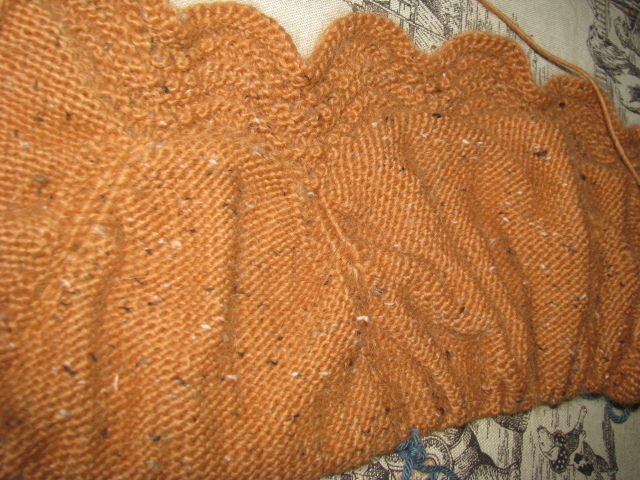 Blocking is important o obtain the points of the lace pattern, something I never seem to have enough room for and always end up spreading knitting projects out on the guest room bed, oh, for a dedicated crafts room. 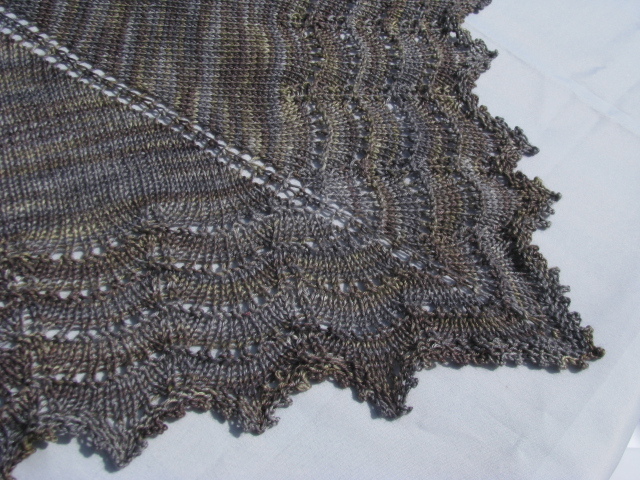 All in all, the Holden Shawlette by Mindy Wilkes is a lovely project, an easy shawl pattern, one that you will enjoy knitting and wearing. 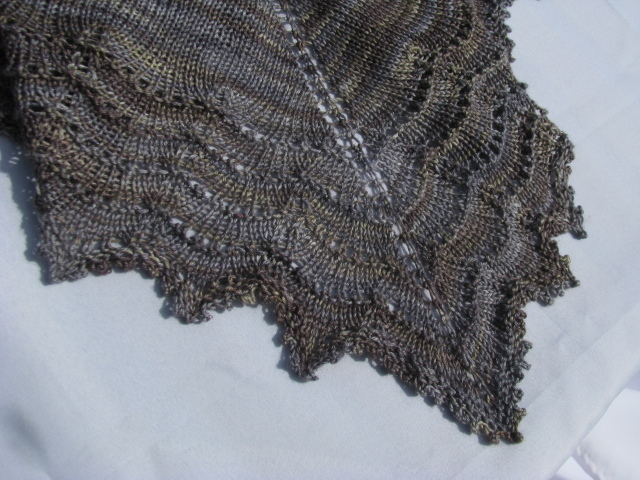 You’ll find more free easy shawl patterns at knitnscribble.com. Now, on to my next project. Besides getting ready for my first ever crafts fair in October at Channing Church in Newport, I’m knitting “Levenwick” by Gudrun Johnston, part of a new exciting collection called “Wool People” by Brooklyn Tweed and Jared Flood, featuring his ” Shelter” yarn. Each design is available as a separate purchase via Ravelry or Brooklyn Tweed. You will want them all! Levenwick is an asymmetrical cardigan, knit from the top-down in reverse stockinette stitch on a circular needle. 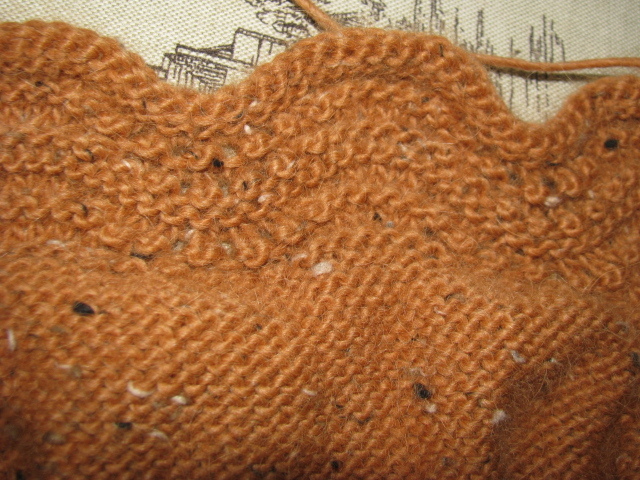 Raglan sleeves are knit separately on dpns. Shelter yarn is without a doubt a gorgeous, free trade, American yarn, but a little out of my price range. I chose Plymouth’s Paca Tweed @8.95 a skein, instead of the $12.50 yarn called for and was very disappointed at first with the Paca Tweed fiber consistency, but when I remembered knitting kids’ ski sweaters with Lopi yarn years ago, I changed my mind. Paca Tweed is very much like Lopi Lite. But of course, there will be adjustments to make in the pattern, using this cheaper yarn, as the gauge is similar, but not the same as the lovely Shelter. But take a look at first choice, beautiful Shelter colorways with quite generous yardage…oh, for an ideal knitting budget! 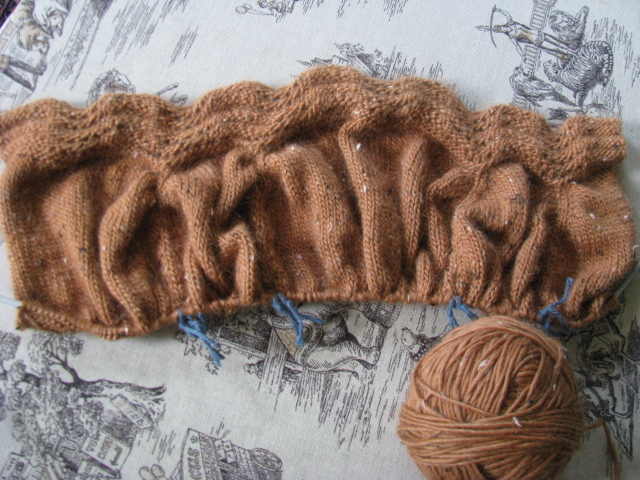 The cardigan begins with the Old Shale patterned collar and is worked on a circular needle. Presently, I am waiting for a new circular needle to arrive, an 80 cm, 32 inch, longer US 7 to continue the project. 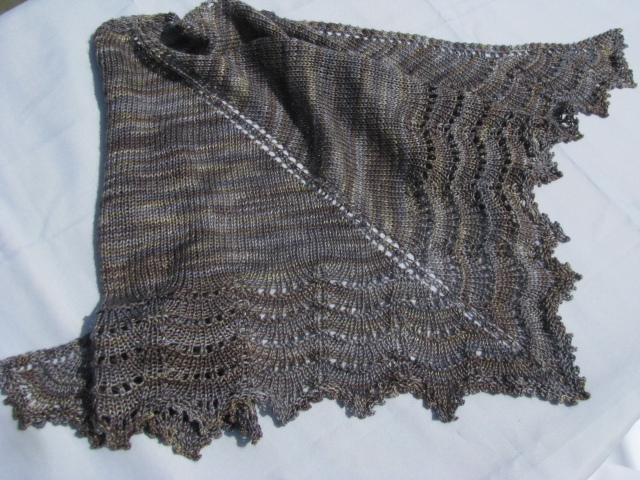 The Holden Shawlette is so intricate and gorgeous! You have an incredible eye for detail! Definitely, Shannon. You should try it. Thanks for reading! looking for the pattern…where can I download it? ?